How do you support students writing a scientific argument after a science seminar? * Extension Discussion: Try it with your students! * Extension discussion - Try it with your students! What strategies did you implement? What additional support do you need to run the science seminar successfully in your classroom? Watch the video below, which introduces the “hypothetical audience” as a tool to support student writing of scientific arguments. In what ways could the science seminar support students in writing convincing arguments? What are some strategies from the video or your own experience to support student writing of arguments? What do you see as key characteristics you would like to see in your students’ written arguments? Introduce the guidelines for writing a scientific argument.Emphasize these are the elements students should include in their written argument. Project an exemplar student argument and use the peer feedback checklist to discuss the strengths and weaknesses of this argument. 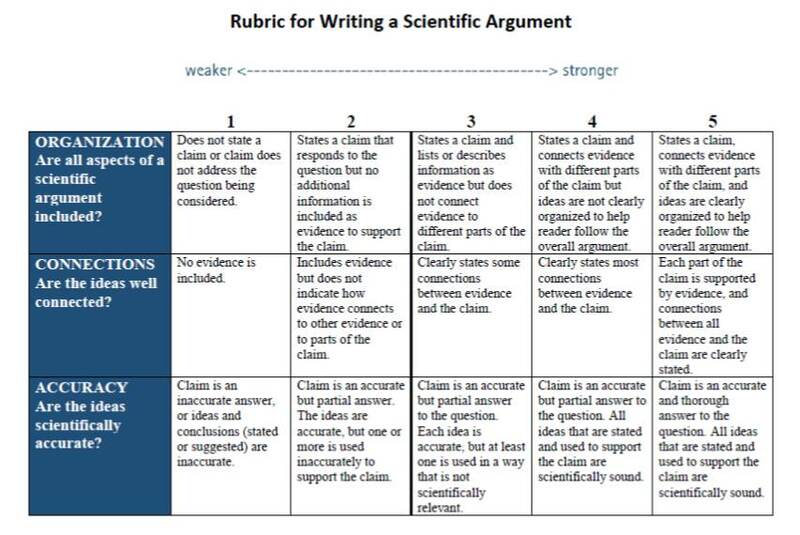 Project the Rubric for Writing a Scientific Argument. Explain this rubric can be used to determine the strengths and weaknesses of student arguments. The rubric includes and expands upon the categories discussed in the peer feedback checklist. This can be used to provide targeted feedback to students in their writing. In pairs or small groups, rate the strengths and weaknesses of each of the four sample student arguments using the rubric. Which argument was the strongest? Why? Which argument was the weakest? Why? How could you use this rubric in your classroom to provide feedback to your students? Engaging students in a science seminar can support students in writing stronger arguments. Teachers can use a variety of strategies to support student writing, such as encouraging students to consider an audience and giving them opportunities for peer critique. Tools such as the argument rubric and peer feedback checklist can be used to help students write stronger arguments.